This Mintos review is 100% unbiased and based on my own experiences after one year of investing. Firstly, as Mintos has a unique business model, and they are not a P2P lending company but a marketplace for loans, they often find there can be some confusion. Mintos affiliates find it very beneficial to give their audience an overview of what Mintos is and how they are different from the rest of the competition. The platform launched in January 2015. It currently serves 59 loan originators and more than 124 872 investors from 73 countries. Mintos has funded more than 2.0 billion euros since it started. 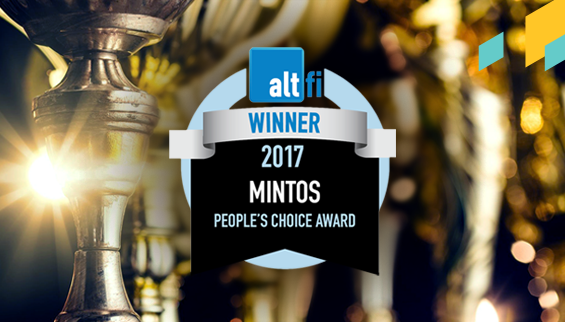 This confirms that Mintos is truly the leading peer-to-peer lending marketplace in continental Europe. How to transfer money to your Mintos account? You can transfer money to your Mintos account from your bank or e-money account. Transfers in EUR can be done easily and at low cost using SEPA (Single Euro Payments Area) transfers. If you have money in currency other than EUR, you can transfer it using money transfer service. What and how to use Mintos auto invest? Above all, Auto Invest automatically implements your chosen investment strategy. After you have entered your investment criteria, Auto Invest will automatically invest in suitable loans. You can access Auto Invest at any time and follow your portfolio activity in real time to make sure it is working according to your investment goals. Auto Invest is a very efficient tool for saving time spent on investment activities. It also allows you to access newly placed loans in the system before manually-made investments. However, once you have confirmed your investment criteria, Auto Invest will review loan listings and invest funds in loans that meet them. Therefore, Auto Invest will then continue to automatically analyze and invest in suitable new loans as soon as they are listed. If you change any Auto Invest setting, all available loan listings will be rechecked to make sure they meet your investment criteria. What is Mintos secondary market? 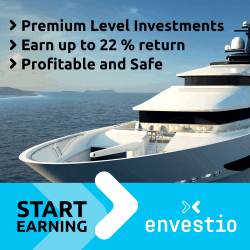 – opportunities to profit by selling investments at a premium. – opportunities to profit by buying loans at a discount. Interest is calculated on a daily basis and it is measured against the amount you have invested in loans on the respective day. In contrast, the formula for calculating interest is as follows: Invested amount * Amount of days * Interest rate/360. How does Mintos mitigate risks? As with any investment, there are some degrees of risk. On Mintos website, they clearly outline these risks and urge investors to evaluate them before making an investment. On Mintos, they have several layers of risk mitigation to make investments on our marketplace as secure as possible. This includes buyback guarantee. If a loan comes with buyback guarantee, the loan originator guarantees to buy back loans that are 60 or more days late. This reduces the risk of an investor losing money if the borrower does not repay their loan. In addition, each loan originator is required to keep a certain percentage of each loan they place on Mintos on their balance sheets. This is called skin in the game. This ensures that the interests of the investors are closely aligned with the interests of the loan originators. Before a loan originator joins Mintos, they perform a thorough due diligence before connecting them. This is done in order for Mintos to be confident in their ability to originate quality loans and service them thereafter. Once a loan originator has connected to Mintos platform they continue monitoring their financial performance and the quality of the loans they place on Mintos. At the time of writing a massive 125 020 loans are available on the primary market. Only 199 of these have no buyback guarantee. But what is the definition of a buyback guarantee on Mintos? Personally I think the buyback guarantee makes P2P lending much more appealing to the average investor! What if a loan originator goes bankrupt? It’s unlikely that all loan originators will perform flawlessly for all eternity. P2P lending is a booming industry and “survival of the fittest” also applies here. After nearly 3,5 years of service Mintos has experienced problems with 1 loan originator: EUROCENT. EUROCENT loans have been suspended for close to two years. Since June 8, 2017, more than half of the invested principal has been recovered. I will not go too much into detail in this post, just be aware that default of a loan originator is likely to happen. You can read more about the EUROCENT default in the Mintos Blog. Like most platforms, Mintos has an “Mintos Auto Invest” feature and it is a single most popular feature of the Mintos marketplace – more than 75% of investors actively use it. So you don’t have to select loans manually every time your account has cash available. 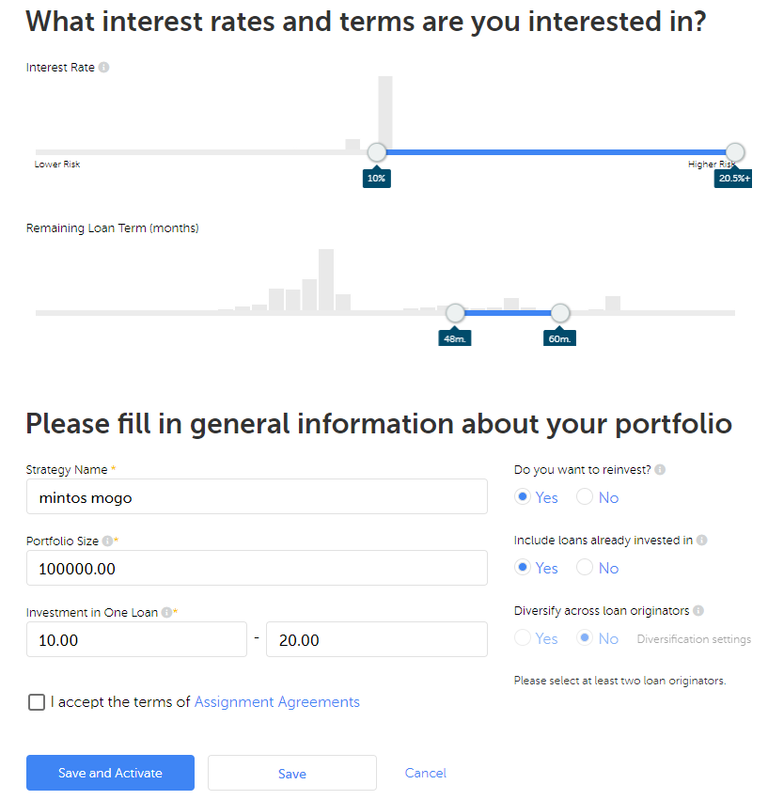 Auto Invest automatically implements your chosen investment strategy. After you have entered your investment criteria, Mintos Auto Invest will automatically invest in suitable loans. My Mintos portfolio is not diversified much. I’d rather maximize the potential on each platform and spread the risk between different platforms instead, but that’s just a personal preference. 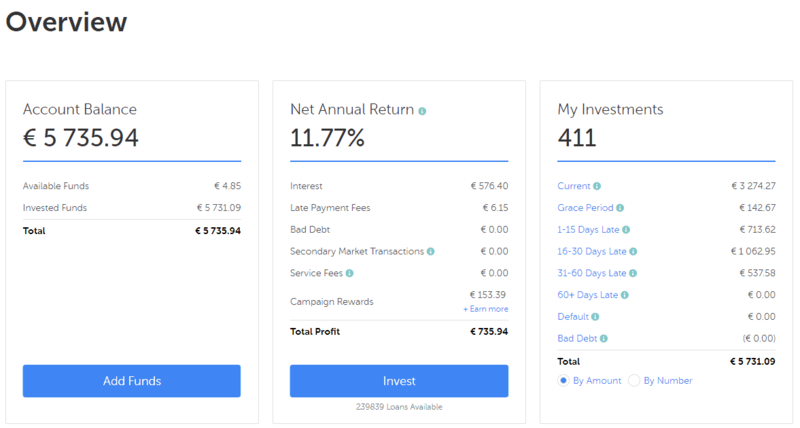 I cannot give you any specific advise on who and what to invest in, but I can show you how I have set up my auto-invest. Below you can see my current Auto Invest settings. The biggest plus about Mintos is probably all the options you have for diversifying your investments. 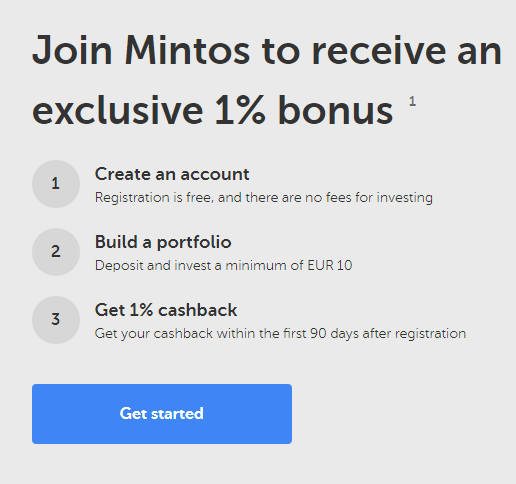 If you’re looking for a trusted P2P platform with a long working history and prime diversification options there’s no way around Mintos. They have a really well working platform and good support as well. Combined with the generous buyback campaigns, Mintos is a must have platform in your P2P portfolio. To start investing at Mintos.com, just simply CLICK HERE! Be sure to check out My Portfolio for other great investment opportunities. I publish monthly updates of my portfolio.